You're interested in buying a product (or a type of product) on. Most people buy on eBay because they believe they'll save money on a product or find a unique or collectible item at an unusually good price. Sometimes, though, eBay deals can slip through your fingers because of your purchasing or bidding style. What's the best way to get the product you want at the best possible price? You could choose to simply buy the product outright, but there's a good chance you'll wind up spending more than you need to. You can place a bid, but there's a good chance you'll be outbid as soon as someone else sees what you've offered. You can set up eBay to outbid other bidders to a stated maximum, but each time you automatically bid you encourage others to outbid you... leading the software to raise your bid... encouraging others to outbid you. Sniping is a better alternative to all these options. Sniping in an auction is a very simple concept. As a sniper, you allow bidders to take their time placing bids and outbidding one another. Then, at the last minute, you swoop in with the winning bid. This process is perfectly legal, but on eBay it can be hard to do by hand. That's because bidding wars may end at any time of day or night, and chances are you don't want to wait up until 3:00 a.m. just to be sure you get the best possible price for that collectible you were hankering after. Enter sniping software. 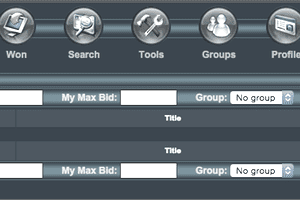 Sniping software swoops in on your behalf to make a winning bid without going through eBay's system which automatically ups your bid whenever you are outbid by another interested buyer. MyiBidder.com is a popular sniping tool that may be a good fit for your needs! MyiBidder.com is an eBay sniping platform that enables you to automatically place last-moment eBay bids without having to use eBay's own bidding system, which could potentially encourage other bids. MyiBidder.com is reasonably popular, with an Alexa traffic rank of 17,421 in the U.S. In addition to being usable on the web, it also offers optional standalone applications for Windows, iOS, and Android devices. You don't have to leave your computer running for snips to work at the appointed time, however, even when using these standalone applications. MyiBidder.com supports group or contingency snipes, meaning that if you're targeting a product rather than a particular listing for purchase, you can place snipes on multiple listings for the product. As soon as you win one of them, your other snipes will be canceled. MyiBidder.com is free for the web-based version, which no doubt contributes to its popularity amongst eBay snipers. Though there are other free sniping platforms, like Gixen.com, there are also sniping platforms that do charge a free, as is the case with eSnipe.com. As with most sniping services, the only way to enable MyiBidder.com to bid on your behalf is to provide the service with your eBay ID and eBay password, which means that if MyiBidder.com is ever compromised, your eBay account is effectively compromised as well. Thus, if you use MyiBidder.com regularly, be sure to watch for any security notices that may appear and to follow their instructions closely.